When we promote or encourage a project or a new initiative, we are guided by the goal of helping to strengthen social capital. Whenever possible, we seek to expand the scale of investments through association with public policies focused on social transformation. By working proactively or meeting demands, our actions are aligned with our strategic sustainability objectives, which prioritize the Health, Education and Traditional Culture, Income Generation and Environment guidelines. • We paid R$105.814 million in total taxes, of which R$ 16.456 million were paid to municipalities where we have operations. • We allocated more than R$ 1 million to donations towards 15 cities and 13 communities. The full table of economic by value generated and distributed can be found in the GRI Table of Content. Despite the fact we almost reached the cellulose production target, 2017 was a tough year with significant losses in critical areas, such as Digester, Brown Purification and Drying. We closed the year with the production of 1,101,634 tons of air dried cellulose (tsa), representing 99.6 percent of the target we had established (1,105,000 tsa). Individual maintenance-related problems were the main responsible for the losses which compromised the final outcome. However, the performance produced valuable lessons for 2018. 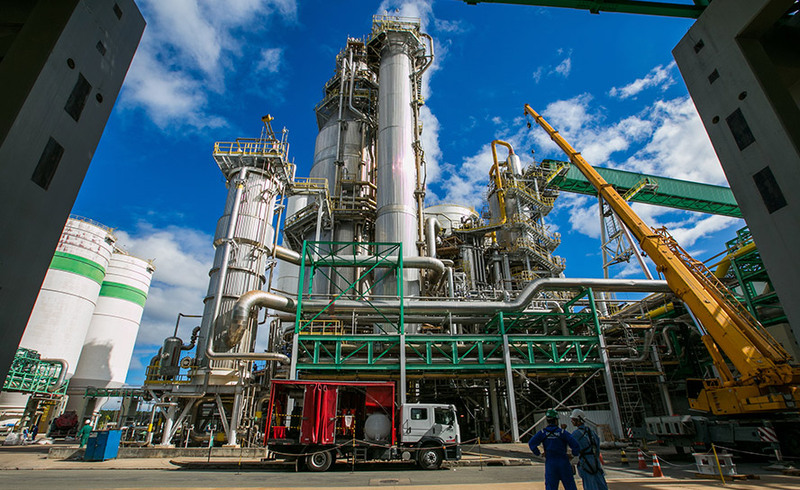 After the General Stop in October, Veracel initiated a series of integrated Maintenance and Operation activities in partnership with Andritz, a partner for maintenance services, in order to increase process efficiency, by strengthening the joint management of the teams responsible for them. The intention is improving the synergy among the areas focused on continuous improvement to surpass the 1,130,000 tsa target established for 2018, a year with no General Stop, and 361 days of expected production. Initiatives to support family farming projects and the multiple forest usage contribute to the employment and income generation for the communities in the region where Veracel has operations. There are projects resulting from agreements and joint public-private institutional work to broaden the scope and enhance the social benefits in the territory, in the fields of family agriculture and beekeeping support. It is a work aimed to produce food for the community itself, with opportunity to market the surplus production. The initiative is conducted through the land granting based on an agreement with the Bahia Forest Forum to share the buffer areas in eucalyptus cultivation near the community. We provide inputs for planting, as well as agricultural training workshops and other sessions related to associativism and cooperativism. The project began in 2009 in the Ponto Central community (Santa Cruz Cabrália). In 2014, it was extended to the Mundo Novo district (Eunápolis) and to Itagimirim in 2015. Designed in the União Baiana community, in Itagimirim, six years ago, the project has benefited 82 families. The program flagship is the manioc, also known as ‘macaxeira’ or ‘aipim’, which is the main product grown in the region. At the beginning of the project, farmers received technical assistance, training and institutional support to professionalize the business. Currently, the manioc planting and sale is the main source of local income. A partnership with the Luiz de Queiroz Agriculture College of the University of São Paulo (Esalq/USP) enables the planning of land reform settlements and a series of actions with these communities. The program’s goal is the qualification and training of farmers, promoting the production with land conservation. The project includes 900 families, totaling about 4,500 people, and has represented the Veracel’s largest social investment in 2017, with transfer of more than R$ 3 million. Veracel and Fibria has worked together in this initiative since 2018, improving its management, adding value to the program and strengthening the actions required for the smooth progress of the stages to create a great and emblematic settlement in the territory. Learn more about Veracel’s relationship with social movements and the sustainable settlements project in the chapter Land Use and Issues. In 2017, two cassava flour and by-products processing units were ready to associations linked to family farmers settled in Ponto Maneca and Guaratinga. The association members can produce flour and other cassava by-products in the units for commercialization, meeting the Sanitary Surveillance Agency (Anvisa) requirements to obtain a marketing license, since the processing units will be equipped with packing machines. Together with the production units, each community association has received furniture, equipments and a utility vehicle for outflow of production. The results are part of the pact between Veracel and the Government of the State of Bahia, whereby we allocated 25 percent of ICMS payable credits annually, from 2011 to 2016, their release, to the implementation of socio-productive inclusion projects in the region, mainly focused on family agriculture. The partnership included the municipalities where the company has operations and several communities based on public notices every year. The pact was not renewed due to a decision of the Government of the State of Bahia. In 2015, a partnership including Veracel, the Executive Committee of the Cocoa Plantation Plan (Ceplac) and beekeepers associations from Eunápolis, Guaratinga, Itabela, Itagimirim and Belmonte initiated the Abelha Rainha project. The initiative enables the high performance queen bee reproduction in laboratory and distribution for beekeepers. The work seeks to expand honey production throughout the region, which has been already stimulated a collaboration agreement among Veracel and seven beekeepers associations. Read See about the project on the Veracel website or see the Ceplac website. 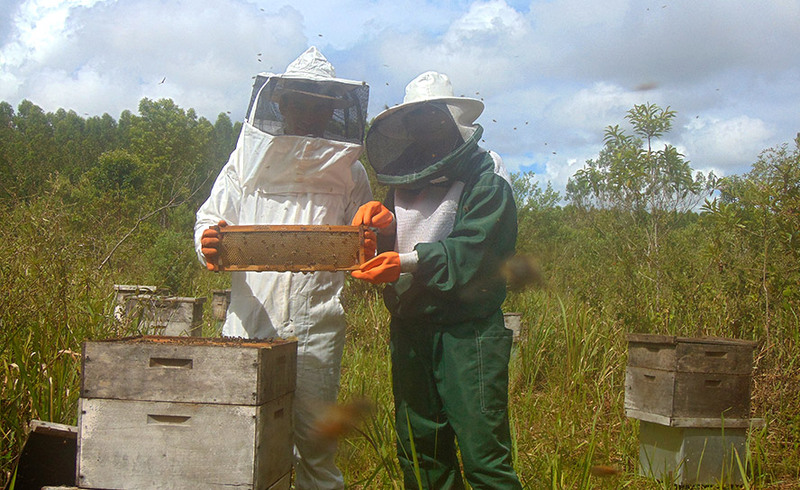 produced 98,800 kilos of honey and generated an income of more than R$ 1.1 million. The Produtor Florestal program (PPF, in Portuguese acronym) has emerged as a way to complement the demand for raw material consumed by the cellulose production. About 20 percent of all the wood supplied to our plant are acquired from 96 producers that are part of the PPF. 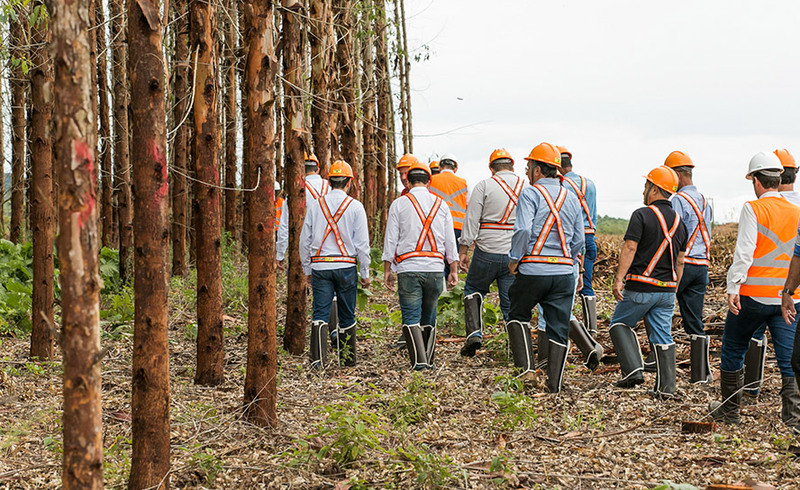 The program was launched in 2003 by Veracel, and the Eucalyptus Producers Association of the Extreme South of Bahia (Aspex) has been responsible for the PPF producers’ certification in Forest Management under the Cerflor and FSC® – Forest Stewardship Council® (FSC-C107658 / FSC-C11049 / FS-C-C111054) standards and its principles since 2014. 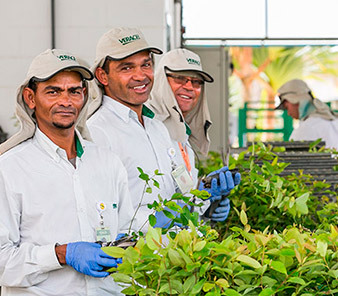 The certifications ensure the compliance with all environmental and social requirements for eucalyptus production. In 2017, the PPF intensified the collection of new areas, seeking to integrate rural producers in the region into the eucalyptus wood production process. Currently, the complementary eucalyptus wood supply is guaranteed by 120 contracts signed with forest producers, corresponding to an area of 20,585 hectares of eucalyptus plantation, of which 16,589 hectares are certified areas. In addition, the PPF has reduced the need for land acquisition and is a way to strengthen the local economy by generating income and employment in the region, as well as enabling the crop diversification in the farms. Giving preference to the neighbor! [GRI 414-2] 100% dos fornecedores englobados no escopo de certificação, totalizando 51 empresas que atuam nas áreas florestal, industrial e expedição de celulose. Deste total, 25 empresas também são auditadas no escopo específico de Saúde e Segurança Ocupacional, cujos critérios de enquadramento levam em consideração a exposição do trabalhador aos riscos. Neste escopo, 100% das auditorias planejadas foram executadas. A média geral de atendimento para os temas auditados nas 51 empresas foi 79,85%. As não conformidades identificadas foram encaminhadas para tratamento, com ações sob coordenação dos gestores responsáveis pelos contratos. A organização não encerrou até o presente momento o relacionamento com fornecedores em função destes temas. *Fornecedores críticos são aqueles que se enquadram em um ou mais dos seguintes parâmetros: oferecem serviços de valores elevados (acima de R$ 800 mil), possuem colaboradores lotados nas dependências da Veracel, fornecem assistência técnica especializada ou oferecem produtos ou serviços que não tenham caráter esporádico. We maintain a close and constant dialogue with traditional communities in the southern Bahia, such as fishing associations and indigenous communities. This practice is part of the management of potential and real footprint, since we occupy a territory with such important geographical and historical features. We maintain an active dialogue with 17 artisanal fishermen associations and colonies located between the municipalities of Belmonte and Nova Viçosa, on the route of the barges that transport cellulose from Belmonte Maritime Terminal to Portocel, in Espírito Santo. 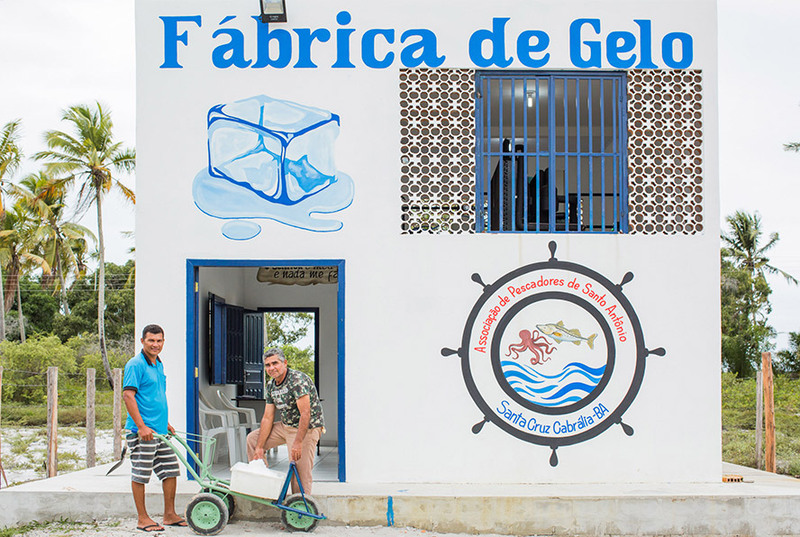 In 2017, an ice factory began to be built in the community of Santo Antônio. The ice produced in the unit will be used to properly store seafood for commercialization. The work is expected to be completed in 2018, when training courses for the community will also be provided. In response to a community demand, a remodeling and expansion project for the Seafood Processing Unit was also initiated in Belmonte. The conclusion is expected for 2018. In addition to these improvements, the project will provide training for association members, including residents who largely live off the fishing and shellfish commercialization. We also support environmental education activities in all the communities that make up the circuit, in compliance with the operation license requirements for the Belmonte Marine Terminal. In the initiatives to promote income generation, Veracel supports a project developed by the State Government to implement the fish farming in the indigenous community located in Santa Cruz de Cabrália. During regular meetings with the community, the company provides training and consulting for the project’s development which directly benefits 25 families residing in the location. O período de seca registrado na região em 2015 e no primeiro semestre de 2016 alterou a condição ambiental e de produtividade de nossas florestas de eucalipto. Como forma de proteção com a falta de água, as árvores aumentam o teor de extrativos, o que gera, para o processo industrial, a necessidade de aumentar o consumo de produtos químicos a fim de suprir o aumento da carga alcalina no digestor. Essa medida sobrecarrega os sistemas, em especial a área de caustificação, que produz o licor branco para o cozimento da celulose, gerando uma redução de produção no digestor. Essa redução na capacidade de produção do digestor fez com que revisássemos a meta de 2017 para 1.105.000 tsa, a fim de evitar maior sobrecarga do processo com o aumento de consumo de produtos químicos. Paralelamente, estamos promovendo uma série de testes, desde novembro de 2016, com o objetivo de obter um produto químico (surfactante) capaz de dissolver os extrativos no interior da fibra da madeira e melhorar a condição do cozimento da mesma. Atualmente, o suprimento complementar de madeira de eucalipto é garantido por 125 contratos assinados com produtores florestais, que correspondem a uma área de 21.425 hectares de plantio de eucalipto; destes, 16.147 hectares são de áreas certificadas. O PPF também reduziu a necessidade de aquisição de terras e é uma forma de fortalecer a economia local com a geração de renda e trabalho na região, além de possibilitar a diversificação de culturas nas propriedades (dados de março/2017).